Is life all about handknit socks? Well I guess I have to agree with you, that is a strange question BUT if you know me and especially if you have been around me or follow me on social media you will have noticed that the last few days have been ALL about knitting socks! If you follow me on social media or regularly read my blog you will know that I joined Sock Madness this year for the first time. This is actually the 10th year they run Sock Madness and if you are not familiar with this, it is a sort of sock speed knitting contest. I believe this year we were almost 700 participants and around 50 per team. Each round we get an email announcing the start of the round and the pattern we are to knit. Even though each pattern usually comes in 3 sizes the minimum requirement is a 9″ sock so at least a medium size. Each time the pattern will present a challenge. It can be an unusual cast on or cast off, an unusual construction, a new heel design, textured stitches, cables, beads, colorwork etc. But there is a stress factor. Although each round runs for 2 weeks, you need to finish ASAP. Every round less and less people make it to the following round. Now round 5 is about to finish and all in all there are 7 rounds. I know I’m not going to win because there are some serious speed knitters competing and even though I’m in the third fastest knitters team (yes I had to share that little fact because I’m super proud of that), I’m still far from fast compared to the express knitters in THE fastest team. So this round for some reason, even though I know I’m never going to win, it was SUPER important I make it to the semi finals, round 6. I didn’t get to start on the day we got the pattern until late that day and since then I’ve had a lot on my plate between work and a big custom dye job and so not as much knitting time as I had hoped for. The last day and a half I was super stressed out. I kept looking at the spread sheet and seeing less and less spots left in my team and I was knitting late at night in bed and during breakfast in the morning and all the hard work paid off! I’m so super happy and proud to say that I did make the cut! I was actually 7th out of 10 knitters in my team. So this round we went from 20 to only 10 that make it to round 6 and at the end of round 6 only 1 knitter from each team will make it to the finals. So round 6 will be a super short round, at least for the fastest knitters. I really wanted to challenge myself and prove to myself that I could do this and I must admit that I’ve seen some yummie prizes that I’d love to win although I don’t know how or who will win those. Maybe just the finalists…. So to celebrate I decided to launch a giveaway on Instagram. And you should definitely join in and try to win my little sock themed prize. So the prize is: a set of Two at a time socks (75/25 merino, nylon) hand dyed just for the occasion, a set of polymer clay stitch markers and a hand crafted needle gauge and kitchener stitch memo by Burning Impressions II on Etsy. I will draw a random winner this Saturday May 21st. I hope you will join and I wish you the best of luck. The winner will be announced on Instagram and not here on the blog as this is an Instagram only giveaway -my first ever so we’ll see how that works out. So until next time, take care and have a wonderful day. I’ll be back soon with some more news on my knitting and more info on the Summer Kal, which will be the first ever KAL I host on Ravelry. 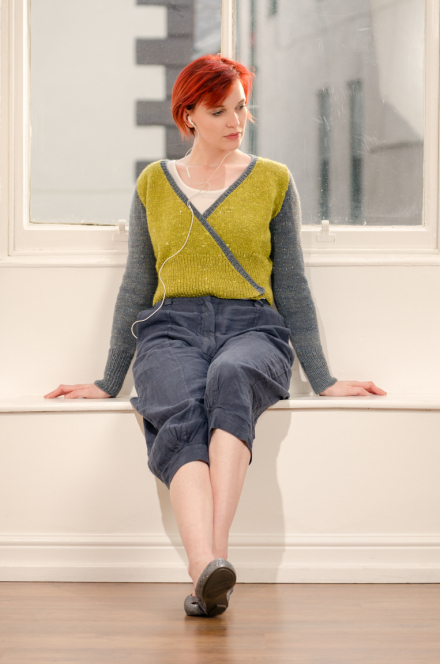 My second ever collection of knitting patterns has been released! The Zen Variations are live! I will be writing about the inspirations and individual patterns over the next few days, but I just wanted you to know that the patterns have been published and I would be so grateful if you would give them a bit of love on Ravelry by clicking the names of the patterns, and favouriting and commenting on the designs you like! All photos are courtesy of Tommy Martin for The Fibre Company. I was recently contacted by one of my blog readers. She had some kind words to say about my blog and she even shared my blog with her own readers. This lovely reader has her own knitting blog and she just posted an article where she shares information on her favorite knitting blogs and my blog is now one of them! That makes me super happy. So of course I went to check out her blog which by the way is a joy to read and I really enjoyed her post on the blogs that she follows. Some of them I had never heard of and as I browsed through these new to me blogs I subscribed to a few. So I think that you too may enjoy discovering these knitting blogs which might also be new to you so I invite you to click here and enjoy some quality reading/browsing.